With this newsletter I have now established positions in four different markets (Long Treasury Bonds, Long Soybeans, Short Cocoa, and Short Cattle). I think all four markets have major potential (otherwise I wouldn’t be in them) and my very firm recommendation is to place equal amounts of money in each market…then do your best to forget you have the positions for the next few months...but I will get to that, the just “letting it happen” phase of trading, further on down the page. It seems like every few years we have a market that just gets absolutely stupid on the upside, accompanied by a world of bullish “reasoning” that suggests the stratospheric levels actually make sense…and fundamental “logic” argues, EVERYWHERE, that prices will STAY high …and THEN THE MARKET COLLAPSES. I literally have seen this scenario too many times to count and we now appear to have the same situation in the Cattle Complex. Prices have gone through the roof the last few months and the bullish “story” (low On Feed numbers, farmers holding back animals for breeding, cheap feed) has spurred press everywhere about “prices being high for years to come”. And same here, in Live Cattle (cows ready to be slaughtered and marketed to the consumer). There IS a big fundamental story out there about why prices are strong and going to stay strong but this is EXACTLY what you get at virtually every top that has ever taken place in the commodity markets. The old adage, “It’s always bullish at the top”, is quite accurate. At some point, all of the bullish news…and emotional fervor…gets built into prices, and there is then nowhere to really go but down. As I constantly remind traders, we are trading the FUTURE, not the present. 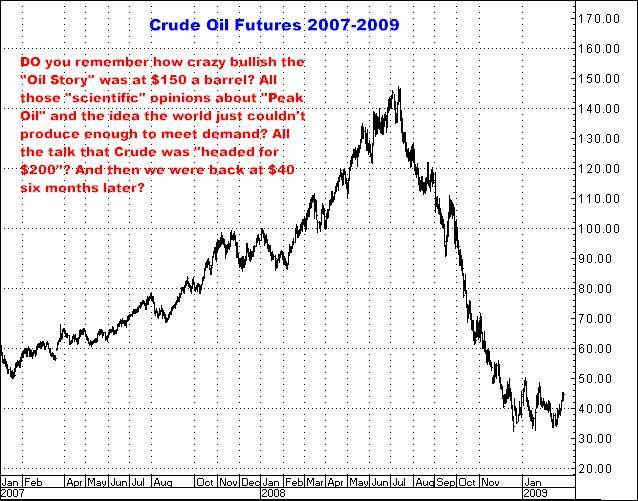 Remember Crude Oil at $150 a barrel? Or how about Gold back in late 2012? 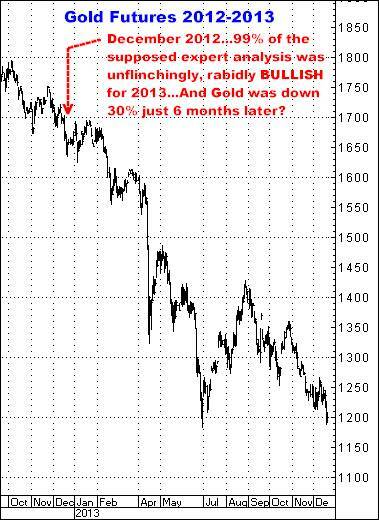 The box below is copied from my December 13, 2012 newsletter in which I pointed out that pretty much EVERY bank, brokerage and financial advisory service on the planet was wildly bullish Gold as we headed into 2013 (for OH so many, SO LOGICAL, fundamental “reasons”)…My own view at the time was pretty much the same as is now the case in Cattle…When 99% of the “logic” is bullish, it’s time to go the other way…I DON’T CARE WHAT COMMODITY YOU WANT TO NAME…THE MARKETS ARE A GIANT MOB PSYCHOLOGY GAME…OFTENTIMES NO MORE THAN A “WHO’S THE LAST FOOL’ SORT OF THING…PLAYED WITH REAL MONEY. I DON’T stick this out there to say, “I was right”. This is just another one of the ENDLESS examples of how EVERY top I have ever seen was accompanied by TONS of EXPERT ANALYSIS that was still rabidly bullish when it was time to be selling with both hands. 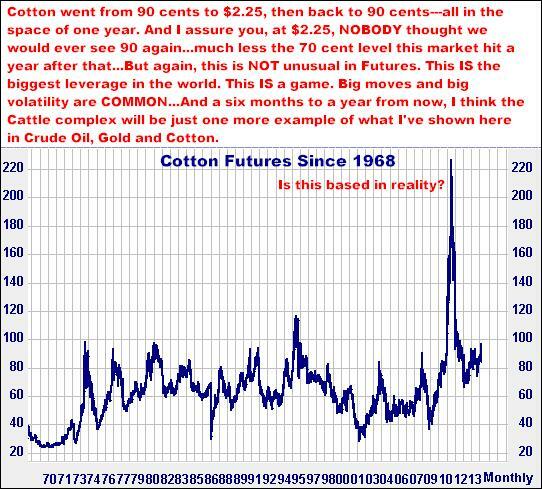 Though they are two quite different commodities, to some degree I have equated the move in Feeder Cattle with what took place in Cotton. Both markets had long established historical highs around the one dollar area…then both quickly more than doubled in price, pretty much in relatively straight up fashion…then died almost the same way (straight down) in Cotton…And I cannot prove it, but these are two “smaller” futures markets that may, I believe, experience some measure of periodic “manipulation” by larger players…which might be the basis for some of the stupefying moves that sometimes occur in them…To some people the possibility of manipulation might be an incentive to NOT trade those markets. To me, I just consider it part of the GAME…I LIKE BIG MOVERS. 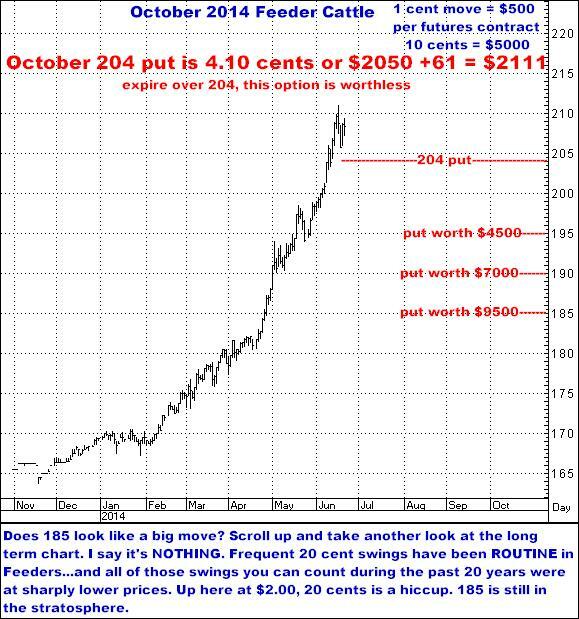 I’ve recently heard a few cattle guys say, “I tried shorting them 20 cents ago” or “I sold my cattle 20 cents lower”, followed by, “I’m not making that mistake (selling) again”. The idea they are expressing is, “I learned my lesson. I’m not selling that market again”, when the truth is, those people are now just scared to do anything. Having been wrong before, they now have the old deer-in-the-headlights mentality…exactly when NOW IS THE TIME TO ACT. You all know what I mean. I’ve been there. You’ve been there…where, when finally the market has become an incredibly outrageous buy or sale, you are so beat up from being wrong that you freeze…and this, I believe, IS exactly where we are in Cattle. 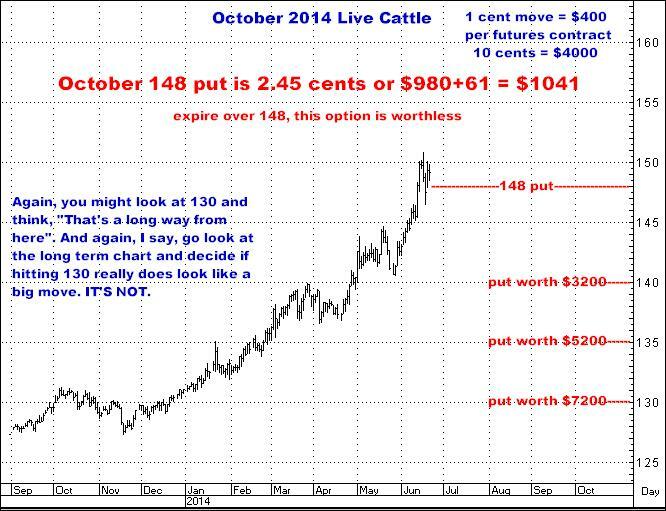 CATTLE PRICES HAVE REACHED THE “STUPID” STAGE. THEY WON’T HOLD HERE. CATTLE ARE A SALE. You buy puts, with some time…and just wait…If it doesn’t do anything, or goes the wrong way, you do more. Sooner or later (and I obviously think it is sooner) they ARE going down and there ARE options that will multiply by 5 or 10 times their value (or more), so if you do have to lose a few times first…but STAY committed to the trade, you do have the opportunity to make a big hit…But I absolutely believe you do have to be there, to own those puts, really, before it starts…The last thing you want to be doing is watching them break 5 or 10 cents and then be trying to get on the trade. 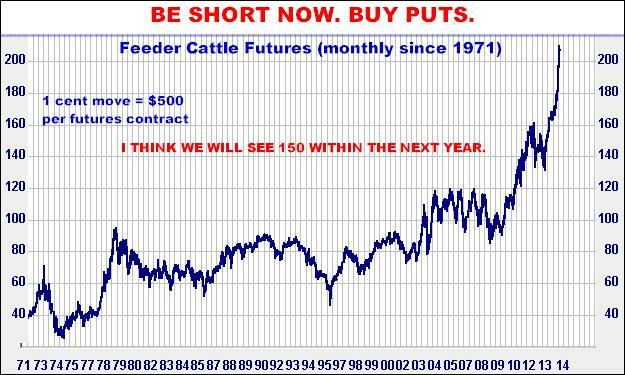 It should be understood, but just to be clear, as strongly as my instincts are screaming, “Sell”, I am obligated to say I might be wrong about all this…Cattle could “stay up”, or even go higher , for some unimaginably long period, in which case, you could end up losing too much money, or for too long, to still be there when the end does come. Obviously I don’t think this is going to happen, but this is a risk I am just as obviously willing to take. The point is, this is not a Free Lunch. There IS risk involved. Along those same lines, I don’t ever write anything here that I don’t believe in 150%. I don’t ever recommend a market just to get something out there. I live and die by my opinion and it’s easy enough to look idiotic in this stuff so I am very careful about what markets I get involved with…I also don’t ever make a recommendation unless I think the trade has major potential, by which I mean, it has the very real possibility of hitting for at least 4 to 5 times what you have on the table. This is not just Bill Rhyne throwing out big enticing numbers. For one thing, I always make sure it’s understood you can LOSE everything you spend on a trade, but on the flip side, the potential for making a 4-5 times your money is simply a function of what options can cost combined with the magnitude of what might considered as fairly normal sized moves in any of the commodity markets I follow. So, opinion is important, but in the end, to me it all comes down to the math. 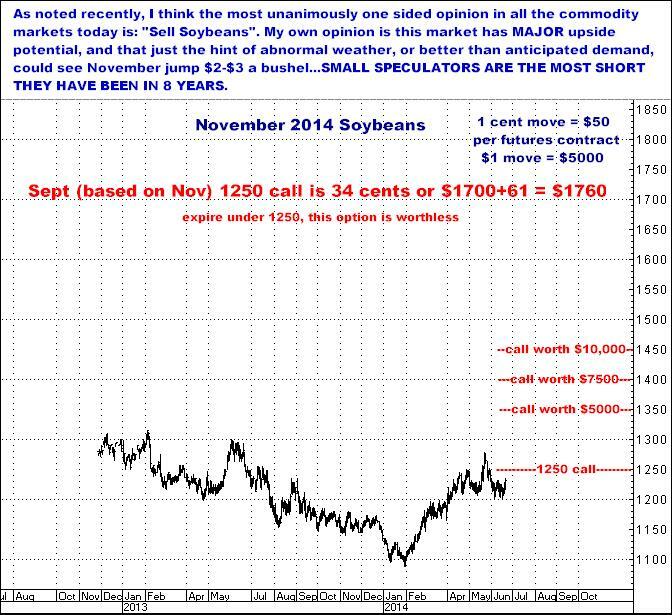 Is a $2.00 move rare in Soybeans? A $1.00 in Corn? Or 10 points in Bonds? $50 in Gold? Definitely not. 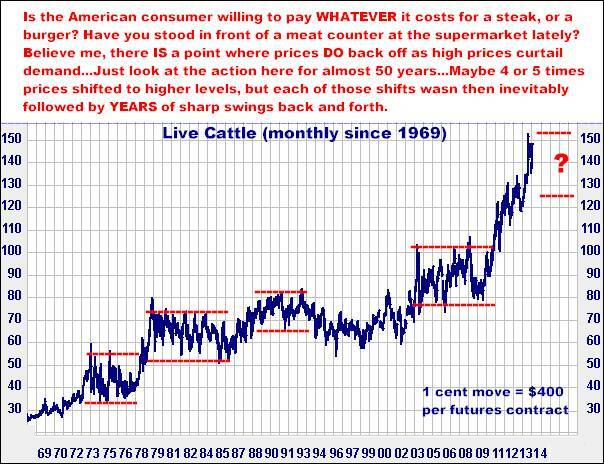 And right now, with respect to shorting Cattle, dropping 25 cents in Live Cattle or 50 cents in Feeders, in my old hack two cent opinion, would be EASY. I think this market is THERE. NOW. Here are the Feeders…cows that somebody has to buy to put on a feed lot, then pay for feed, as well as fees to the feedlot (and veterinary care), all with the idea they will be able to sell that animal 5 months later and clear a profit for having fattened it up. One final note, probably only understood by anyone in the Cattle business…I have watched opinion in Corn go from wildly bullish a year ago (at $8.00) to overwhelmingly bearish with December corn now at $4.50. Great crop coming and all that. From my perspective, my guess is a $1.00 rally in Corn could be imminently easy from here during the next few months…which would most likely SLAM the Feeder market (where expectations are for Corn and Soybean Meal prices to stay lower, or even go lower still). All we need is one weather “scare”, much less a true weather event…or further turmoil in the Middle East jacking up Crude prices…and Ethanol with it. 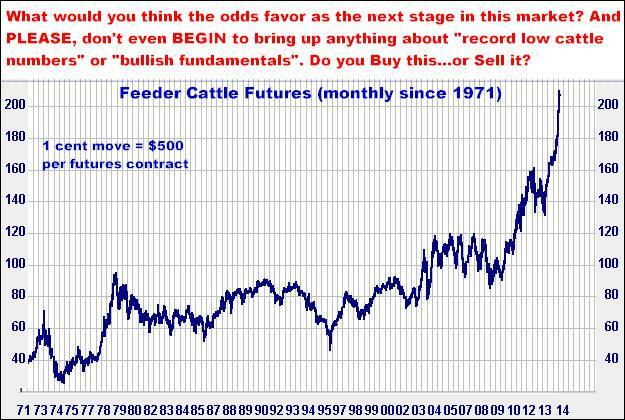 The bottom line is, the Cattle markets are absolutely priced to perfection…and very briefly stated, the weather, and the world, are not in a perfect place. If I am wrong about all four, you will probably lose 100% of what you put on the table. If I am right on just one, and totally wrong on the other three, you still have a decent shot at coming out ahead. If I am right on two, and totally wrong on two, you are probably going to come out with fairly substantial gains that would make anybody quite happy. And if right, even just moderately, on 3, or all four…? Well, you can do the math. 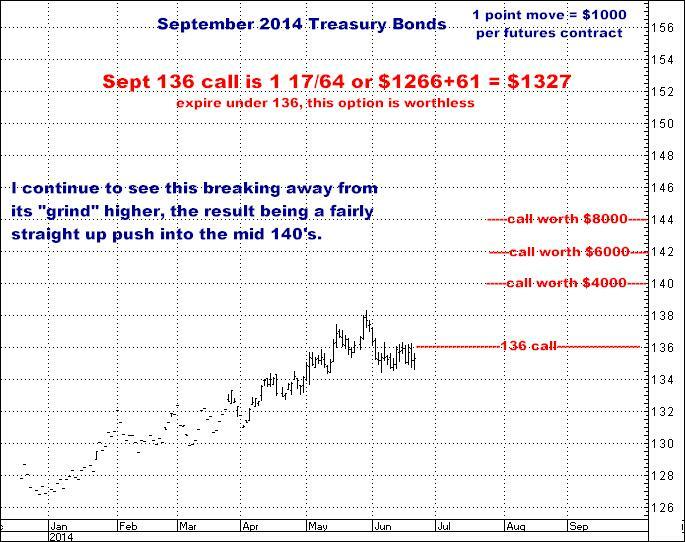 Buy Calls in Treasury Bonds and Soybeans. Buy Puts in Cattle and Cocoa. Don’t even look at them for the next month. I know this is probably not going to happen but I have long understood that, “the screen is your enemy” and if I wasn’t chained to this desk, I would do my homework, put on positions, and then check them just as I recommend here…once a month. In other words, start by putting the money on the table in hopefully well thought out, well constructed positions…Then LET THE MARKETS DO WHAT THEY ARE GOING TO DO. Nothing happens overnight and your best shot at making money is the old thing of, “Let the winners run”, which, I can assure you, the more you watch, the less likely you are to do…Conversely, if there are losers, that’s what they are. You risk has been determined by what you’ve paid for the option in that market…and there is the possibility that a particular losing position has then become a “better trade”, and worth adding new positions with more time…maybe funded by partial gains from the winning positions…or maybe that losing idea is just one that should be abandoned…But the main thing is, that loser is not where 100% of your money is…or was. I continue Buying Treasury Bonds. 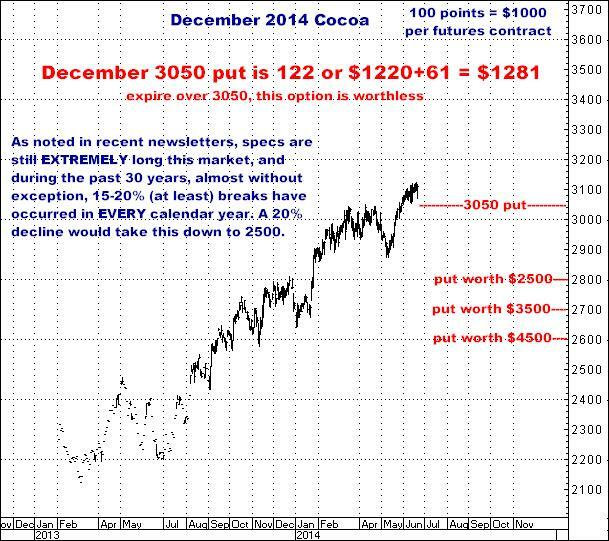 I CONTINUE BUYING PUTS IN COCOA…NOW GOING OUT TO DECEMBER. Okay…enough for one sitting…Doing all four markets (using Feeder Cattle in the cattle complex) works out to about $6000, and the number goes up to about $7000 if you add Live Cattle. As always, these are my own opinions and I may be dead wrong, but I think this “package” is well conceived, has great odds and enormous potential. Give me a call if you want to talk about any of it…Or just to say hello. I always enjoy talking to all of you…about anything really. The author of this piece currently trades for his own account and has financial interest in the following derivative products mentioned within: Cattle, Treasury Bonds, Cocoa, Soybeans.